According to a Securities and Exchange Commission filing (2006 Annual Report) filed by Marchex (NASDAQ: MCHX), the publicly traded company owns Dolphins.com (as of 2006). Further, in the same filing, Marchex listed MDNH, Inc. as a subsidiary, and Dolphins.com is currently registered to dnsadmin@mdnhinc.com. MDNHINC.com is registered to MDNH, Inc. This is a high value domain name, both because of its generic nature (animal domain names are always in demand) and because of the NFL team with the same name. This is going to be an interesting case to watch with these two heavyweights going at it, especially because of the potential impact of losing the domain name could be on Marchex’s bottom line. IMO, this is easily a six figure domain name. Hmm, there must be a domainer out there who is a Dolphins fan 🙂 Someone tip the team off about this parked page? Just looking at your screenshot, I believe they have a very good chance of getting this domain name. i think the team wins dolphins.com – the current site is confusing (color scheme is identical to nfl team) – miami dolphins will win the initial round but i bet to avoid prolonged litigation, it will purchase name (for far less than fmv). Talk about bad faith. 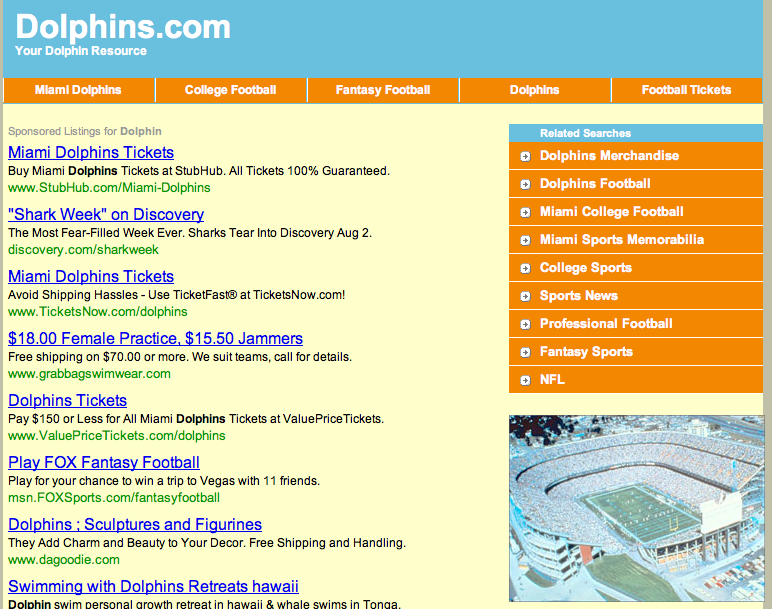 Showing ads for Dolphins tickets, the football stadium graphic, the color scheme, the for sale link in the footer, ALL of the related search keywords being about football, them buying it after the Dolphins had their TM, etc. Even the title of the page says “Miami Dolphins”. Seems like a slam dunk for the football team. If they really didn’t buy it in bad faith, I would think Marchex should have enough cash to splash to throw up a mini site about the animal to make sure they can hold on to the domain. After the fact is too late…doesn’t usually work from UDRP cases I’ve read. Something tells me that if the Miami Dolphins win this it’s going open the floodgates for a spike in UDRP actions. While Marchex might have miss-stepped. This is one UDRP that they MUST win for the sake of all domainers. With a parked page showing ads like that they have basically handed them the domain on a silver platter. imho. Silly way to lose a valuable generic. Technically, Marchex should win because they only USED it in bad faith. They didn’t REGISTER it in bad faith since the content was not SPORTS related at the time they acquired it years ago. The content must have changed only recently to SPORTS. Both bad faith Registration AND bad faith Use must be proved under UDRP. It’s not an “OR” requirement. But even if Marchex wins, it will be short lived because NFL can file a Trademark Infringement lawsuit shortly afterwards which would almost certainly be a losing case for Marchex since the Trademark Infringement standards are very different from UDRP standards, and their actions are clearly infringing by Trademark standards. I hope Marchex loses the domain. How darn stupid!!! I think all you domainers (I’m a domainer also) above should not be supporting Marchex on this one. This case is just out of line. This is what is bringing us all down. I have no respect for Marchex doing this. It’s just too blatant. Losing this domain should be a wake-up call to domainers to stop this sh*t.
@Johnny, they deserve to lose in COURT, not UDRP. UDRPtalk, so you’re telling me that if the previous owner of Windows.com had content about windows for houses, then I bought it from him, I could sell copies of Windows Vista and win a UDRP? I could have sworn I heard just the opposite… that for the purposes of UDRP, purchasing a domain counts as a new registration. Anybody in the know care to clarify? Actually Shane, part of owning a trademark is the responsibility to defend it when companies like Marchex infringe on it. I doubt the Miami Dolphins are just trying to get something for nothing… they’re defending their mark as they are required to do as TM holders. UDRP seems like the appropriate venue to start things off, and if that doesn’t work I’d imagine they would file in federal court. I get extremely, extremely frustrated when I see BS UDRP decisions where generics are taken away from their rightful owners without enough supporting evidence. However, I feel like Marchex deserves to lose this one, whatever implications that may have for the rest of us. Marchex is giving us all a bad name by targeting Miami Dolphins content/keywords on their parked page, and by saying that we hope Marchex wins, we’re making the industry look even worse. You can’t be against cybersquatting as long as it doesn’t hurt you. It’s all or nothing. I believe dolphins.com (along with jets.com) used to be owned by GregR. Jets.com cleaned up it’s act, but used to display Jets football related stuff. @Mike, they acquired it a long time ago, but they didn’t have infringing content until recently, so they should win the UDRP, but lose in COURT. Whether Marchex wins or loses, somebody deserves to be fired for their incredible stupidity. I can’t imagine how they are going to defend that one with all those ads showing. It will be interesting to see how this one goes. I have to agree, putting up anything related to the Miami Dolphins or even football on that domain is not very smart at all. Marchex should know better. Marchex did not register the domain. It was acquired, wasn’t it? That can make a big difference in the outcome. You’re right but it does not always work out that way unfortunately. @Patrick, “acquired date” is treated equivalent to “registered date” for the purposes of evaluating a UDRP. So MARCHEX should “technically” win. If they end up losing, it’s because the arbitrator was incompetent. I wouldn’t mind the ads, but really cant understand the colors and the stadium image. In my country we eat the dolfin food. We do not have this udrp to make us not eat. Let’s forget the current state of American law and UDRP rules for a minute and use some plain old common sense and fairness. Should the football club have the “right” to own miamidolphins.com – probably. Should they have the god given right to own dolphins.com – don’t be ridiculous. That is sheer nonsense and arrogance. 20 years from now people will look back on these rulings and shake their heads in disbelief. UDRP Talk: you are so wrong. Registration continues forever. The name is currently registered. It is being used in bad faith. Marchex loses. There are plenty of cases with this fact pattern. Even if ‘Fins lose the UDRP, which is very unlikely, they will almost certainly win in federal court under ACPA. Mike Mintz (and others): you are very right. Super foolish behavior by someone at Marchex. Basically giving away a six figure domain name for a few hundred bucks a year in PPC. They clearly ought to have known better. I wouldn’t take this case for Marchex, because they’re acting like a cybersquatter. My gut is telling me the Miami Dolphins will win this UDRP case. Bad faith REGISTRATION/ACQUISITION is evaluated AT THE TIME OF REGISTRATION/ACQUISITION per UDRP rules. MARCHEX has at least 3 years of GOOD FAITH USE before they started infringing lately. NFL should have sued instead if they wanted a guaranteed win. The secret here for Marchex is to immediately remove any references to football and the Miami Dolphins. Although some people can argue “this is too late”, it still looks a lot better during the UDRP rulings to have a current website that can show the reality of what the domain name represents… cute mammalian fish of the sea that everyone loves. Marchex can win this by simply and quickly changing up their meta description and keywords, changing their website look to show nothing but the dolphin, and arguing that placing “similar keyword results for the word “dolphin” isn’t a crime or a TM infringement if the Miami Dolphins turn up in SE search results on the word “dolphins’. POINT TO FOCUS ON: In a search for “Dolphins High school team names”, I found 15 high schools within the top 50 results in the US that use “Dolphins” as their team name. Can they advertise “Dolphin” tickets and products? @UDRPtalk – I agree with the “bad faith” argument. The domain name “dolphins.com” can’t be unequivocally established as a “bad faith” domain purchase because there ARE adlinks on the webpage for the animal called a dolphin. If other adlinks appear because the Miami Dolphins are using the term in keyword advertising, or their team’s name appears a million times in SE results, that’s NOT the fault of the owner of DOLPHINS.COM. I would of course support the Miami Dolphins in a UDRP of “MIAMIDOLPHINS.COM” , which is what their REAL TM is. Their TM is NOT the hugely generic word “DOLPHINS”. So I see the NFL team losing this one if the owner defends his position logically and removes, even belatedly, any reference to the Miami Dolphins. Another area of argument would be for all of you SEO boys using TM keywords to bring in traffic to websites, even tho the websites don’t come close to TM names. Using a TM keyword to bring eyeballs to your site doesn’t make you a cybersquatter, so in that logical process, owning the domain “DOLPHINS.COM” doesn’t make you an infringer of the MIAMI DOLPHINS based on the domain name alone, and using keywords to sell Miami Dolphins tickets/products is only doing just what it is — using TM keywords to promote a site. That situation is NOT within the scope of ICANN during a UDRP. Using the truth of the domain name as it stands alone eliminates the TM bad faith argument, and the careless use of keywords and meta tags to sell TM products, doesn’t enter into the UDRP argument without first establishing that the purchase of the domain was done in bad faith and intentionally meant to steal from the Miami Dolphins. I’m not an attorney, but I should be. Here’s a case where Marchex could have developed the site much better and easily strengthened their position in this case. Putting on an obvious parking page is moronic, and the fact they don’t even have JRS in the picture of the stadium (or Landshark Stadium or whatever it’s called this week) is evidence of bad faith, even if not bad faith, itself. @Tym B, I agree the Miami Dolphins would win, hands-down, any UDRP for miamidolphins.com, but dolphins.com, being much more generic, should not be guaranteed in this case. Nonetheless, a bit more assiduous development on the part of Marchex could have helped protect their investment in a valuable domain name like dolphins.com. Only Marchex knows for sure if they’re squatting, but a PPC landing page is convincing enough for me to believe they’re playing a lottery, waiting for the ‘highest bidder’. PPC revenue on this could not be very strong. How did Marchex catch the Miami “dolphins”? IMHO, one thing that will clinch this for the Dolphins franchise is if Marchex has SPECIFICALLY selected Miami Dolphins keywords to display those ads, AND if so then the parking company may be implicated as well. If I had owned dolphins.com I would have done everything possible NOT to show anything on the site related to the Miami Dolphins football team. A site about dolphins or aquatic centers would have been so easy. Now they have a good chance of losing this name, and can’t say I’d disagree. @ Stephen Douglas……Wrong my friend! Changing the content now would be considered bad faith and it would be brought up in the UDRP. It would be considered evidence that you using the domain in bad faith. I’m not sure where you got that idea because it is well known that if you change the content after being contacted it shows your “intent”. It makes you look like you knew you were doing something wrong. Why do you think they have not change the page yet? For that reason. Their lawyer told them, “Don’t change a thing”. It goes against reason….but that is how it is. The saddest part about this is it would have been ridiculously easy to set the site up as a fanzine or blogs. They could possibly have done some kind of affiliate deal with the football franchise, itself. A “simple” error was made (on purpose or by accident) and that justifies taking away someone’s property? The whole intellectual property, patent, trademark, copyright issue has gotten way out of hand in my opinion. We need to challenge the current thinking at every turn, and not just accept recent precedents as logical or fair. Yep, I considered those points before I made my comment. However, as I stated, it’s not about “bad faith registration” on the domain, since the Miami Dolphins INTITIALLY cannot claim the word “Dolphins” as a TM. Since they cannot claim the word “Dolphins” as a TM, they can’t use the UDRP to remove the domain name. They can sue on other levels, such as unauthorized usage of the Miami Dolphins’ TM on the site, but it doesn’t apply to the domain name registration and ownership itself. About changing the content of the webpage, I thought hard about that, and there are two camps to follow. I’m sure John-Bear can ascribe a better analysis beyone mine, but the way i see it is that the arbitrators will see the domain name webpage as what it CAN BE outside and away from the Miami Dolphins webpage and products. This is a complaint about registered a domain in bad faith, and that has to be proved by the filing party. Presenting a current “image” of the website which takes the domain “dolphin” in several other directions might sell that point easier. Blatantly leaving Miami Dolphin content up may look as arrogant. So… I agree with your assessment on that level, to NOT change the content of the page (which really isn’t what the contention ultimately will be in the long run), but I also think that displaying what Dolphins.com can or now is, without the football team, is also a “selling point” in the UDRP. I also mentioned there are many high schools football teams that use “dolphins” as their team name… which one really gets to use the TM? Why would the NFL team rate higher in that order than a high school? Thanks Johnny for getting my head deeper into this… it is a quandary. You morons who keep saying that Landshark stadium is in the picture need to give your head a shake.. That is a picture of the old Orange Bowl, which was demolished. Landshark stadium goes all around like an oval.. it’s not cut out at the corner end zones like that picture shows.. As a native Miamian, and one who has been to the orange bowl over 100 times, that is the old Orange Bowl. Who the hell cares? What’s your point? Irrelevant to this conversation and post.